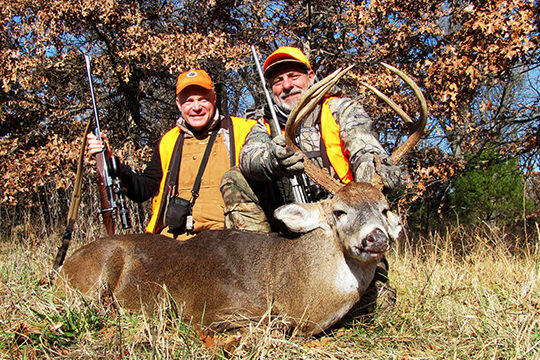 Craig and his neighbor Chuck Herbel are hosting two whitetail hunts on their adjacent farms near Elk City, Kansas. Craig will be on hand to swap stories over a meal, sit in the stand with you, show you around and possibly run the grill one night. Hope for cold weather and expect a great time with good food and fine people. The farms consist of 1500 acres of well-managed agricultural land and food plots atop rolling hills punctuated by heavy oak ridges. The buck to doe ratio is high and there are a good number of mature bucks. The hunting is best from tree stands, ground blinds and tower blinds. It’s not Kansas’ easiest deer hunting, but the bucks are here. This is Craig’s fourth year hosting this hunt. The last three years were a great time to get to know one another in a very relaxed setting. *Maximum 5 hunters per hunt, limited openings remain. Fly into Tulsa and the area is a two hour drive away. The cost of the hunt is $3900 and is all-inclusive from arrival with the exception of Kansas license and tag. Application period for nonresident licenses is the month of April. The hunt unit is 12. In Kansas "adjacent area" tags may be used in case the licenses sell out, so 11, 13, and 14 will work. Previously there have been tags left over, first come, first served, until July 1st, but there is no assurance that this will occur, so hunters are encouraged to apply during the April application period. Permit includes buck and doe. Additional doe permits are available. No Chronic Wasting Disease (CWD) or Epizootic Emhorragic Disease (EHD) has been identified in this area.